There are a few versions of the shredded chicken crust around the internet ... here's how I do it. I came up with it when I accidentally overcooked my chicken and it ended up as mush. This totally saved it! -Preheat oven to 400F. Line a pizza pan or two cookie sheets with parchment paper. -Put chicken in a food processor and run until it's ground (takes me about 10 seconds). -Mix chicken in a large bowl with all other ingredients. Divide into four blobs and spread each blob on the parchment paper until it's about the size of a fajita tortilla. You want it spread fairly thin. 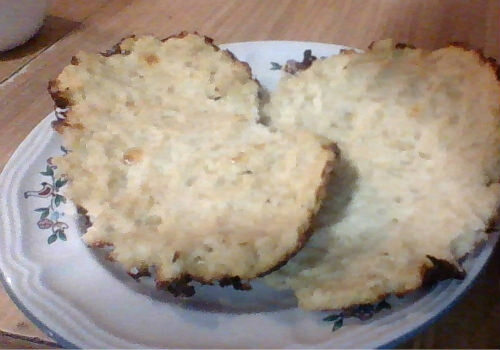 -Bake about 25 minutes or until the center is no longer wet and the edges have turned brown. Macros: each crust/wrap has 25g protein, 2g fat, 2g carbs. Now, you're not going to mistake it for Domino's ... it tastes like chicken. What it really has going for it in my opinion is the chewy texture and the crispy-crunchy edges. I think that texture ends up missing from RFL diets and it's a nice change to have it! You could probably even make more small crusts, like silver dollar pancakes, for more crispety-crunchety edges, and eat it like chips. I haven't tried freezing them, but they keep pretty well in the fridge. The recipe doubles well. Any more than that and you'd have to bake it in batches, unless your oven is bigger than mine. Anyway, you can top it like pizza -- tomato slices/basil/fat-free mozz or paneer for a margherita pizza; low-carb bbq sauce/onions for a bbq chicken pizza. You can use it as a wrap with lettuce or chopped steamed veggies inside -- seasoned with taco seasoning for a chicken taco; seasoned with Greek seasonings and fat-free tzatziki for a Greek chicken wrap. Use it like a flatbread and cover it with spinach/mushrooms/garlic. Roll it around steamed cabbage/soy sauce/ginger for a fat chicken egg roll. Etc.